Step up your matzah brei game and pack your eggs with vegetables such as onions, spinach, tomatoes and broccoli. Instead of butter, drizzle in heart-healthy olive oil. Add smoked salmon for additional protein. Pair with avocado for additional heart-healthy fat. Sick of matzah brei? As the week goes on, matzah brei may get old. Consider switching up breakfast and trying shakshuka loaded with tomatoes and eggs, and use any extra seder plate herbs for the dish. Complement charoset with additional nuts such as walnuts, almonds and pecans. Add a variety of apples and cinnamon. Throughout the week, use charoset as a topping on salads and as a side dish for meals. Enjoy bright-colored tzimmes with apples, carrots, sweet potatoes and dried fruit. Add in heart-healthy nuts for an extra crunch. Diversify dessert by inviting seder attendees to a “make your own” parfait bar. Use plain Greek yogurt, which is packed with satisfying protein, chopped walnuts, extra charoset from the dinner and fresh fruit, such as mixed berries and cherries. Pre-roast vegetables in bulk. Cauliflower, brussels sprouts, asparagus, carrots and sweet potatoes all make delicious side dishes and salad toppings for the seder and during the week. Reverse your avocado toast recipe. Cut an avocado in half, remove the pit, crack an egg into each half and top with smoked salmon. Bake at 400 degrees for about 15 minutes or until the egg is cooked to your desired texture. Top with capers and chives. “I don’t like matzah, but I miss carbs.” Add cauliflower to your mashed potatoes and use it to make cauliflower pizza crust. Try kugels using eggplant, sweet potatoes and carrots. Riced cauliflower makes an excellent substitute for rice dishes. Try zoodles, including zucchini, beet, carrot and summer squash to make “noodles.” Toss with olive oil and Parmesan cheese, tomato sauce or pesto. 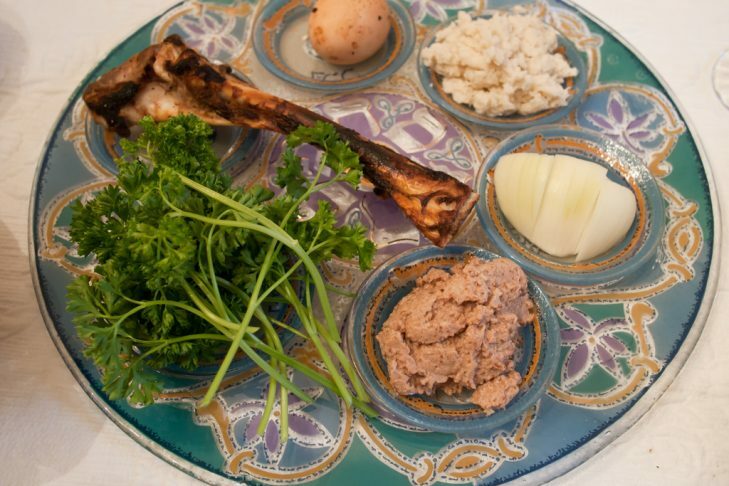 Get crunchy and creative with pre-seder appetizers. Top sliced cucumbers with your favorite hummus or bean dip and use colorful vegetables, like carrots and beets, to make latkes. To learn more, visit nutritionbyelissa.com.